There are many products now on sale which give a green alternative to the traditional cleaning products containing ammonia and bleach. Look for terms such as organic, biodegradable and toxin-free. 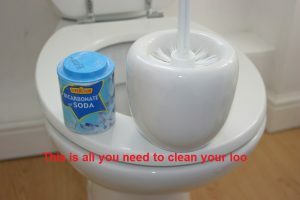 In time your toilet bowl can become stained and unsightly. Rather than using a horrible toxic cleaner, a good dose of Bicarbonate of Soda can produce sparkling results. Baking soda can be used as an odour eater or stain remover for your carpet. Just sprinkle a little on the floor, leave it to do its job then vacuum it up. 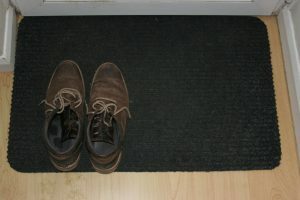 Try and keep dirt out of your home with a good doormat and/or a ‘shoeless house’ policy. Less dirt means less sweeping, mopping, and vacuuming, which results in less work for you and reduced use of water, energy and chemicals. If buildings are designed to make cleaning simple and easy, those spaces become cleaner, healthier, and require fewer substances to maintain. In larger buildings, this can translate into money-saving because cleaning can be as much as 50% of a building’s total maintenance costs. Make your own all-purpose cleaning scrub by mixing baking soda with enough plant-based liquid soap to make a paste. Spread some of the paste on half a lemon and use to rub down kitchen surfaces. Finish by wiping with a damp cloth. 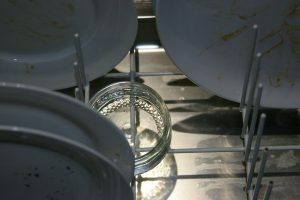 Prevent misty spots on glassware by placing a cup of white vinegar on the bottom rack of the dishwasher, run for five minutes, then run through the full cycle. Try making your own air freshener – heat cinnamon, cloves, or any other herb in water in the affected room. Cleaning chemicals used in your home can raise indoor air pollution (due to volatile organic compounds – VOC’s) by as much as x100. 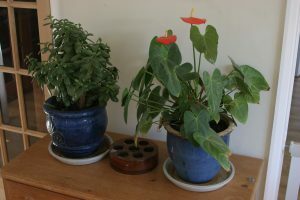 Plants in your home can help remove these nasty compounds. 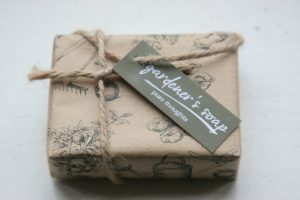 It has been shown that antibacterial and antimicrobial ‘cleaners’ are no better than regular soap and water. In-fact they increase the risk of breeding ‘super germs’, ie bacteria that survive the chemical onslaught and develop resistance to the very chemicals made to kill them. Throwing out toxic cleaning products can be harmful to water supplies and landfill. Check with your council how to dispose of them. Incredibly, conventional dry cleaners are the largest users of a toxic, smog creating industrial solvent called Perchloroethylene, or Perc. Try and find dry cleaners who use green methods such as carbon dioxide cleaning. Only 30% of the 17,000 petrochemicals available for home use have been tested for exposure to human health and the environment. Check carefully on the packaging for unpleasant additives.